An all-white, all-male Very Important London science talk — Richard Dawkins is one of the headliners — preemptively told nutty super-sensitive "feminists" (their quotes, not ours) to go on Facebook and Twitter if they wanted to "drone on about the lack of women" in the line-up. When they did, the site crashed and the hosts deleted the "joke." Nice try. Entangled Bank Events, a UK charity "run by a group of experienced business and events-management volunteers who are passionate about science," is hosting a London science talk on November 16th featuring Bill Bailey, Richard Dawkins, Richard Wiseman, Richard Fortey and Quentin Cooper "for original science presentations, group discussion, and geek-pop by Jonny Berliner." In the FAQ, you can find helpful answers to all sorts of questions: "How big is the venue? "; "Is the event suitable for children? "; and "I am a fanatical, misandristic ‘feminist’. 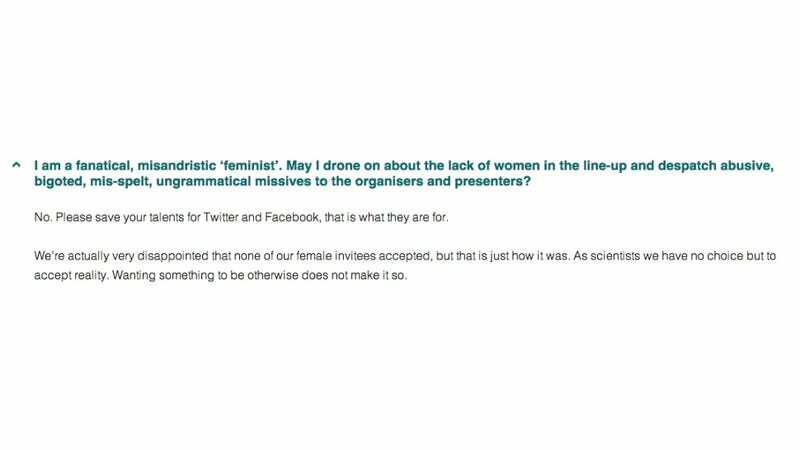 May I drone on about the lack of women in the line-up and despatch abusive, bigoted, mis-spelt, ungrammatical missives to the organisers and presenters?" Ah, men of reason and logic! They want qualified, available female speakers to exist, but couldn't find any (we're sure they tried very hard). Can you wrap your puny lady brain around the meaning of "reality" ??? Entangled Bank Events deleted the question off their FAQ after their site crashed from all the "bigoted" feminazi attention, but has yet to issue an official response or apology.